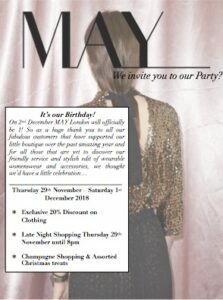 Local independent fashion retailer MAY London will officially be 1 year old on 2nd December. As a huge thank you to all their fabulous customers for supporting this little boutique over the past year and for all those that are yet to discover their mix of friendly, knowledgeable service and stylish edit of wearable womenswear & accessories, they thought we’d have a little celebration to kick off the festive season! MAY London is a vibrant, local boutique, bridging the gap between high-end and high street with passion and expertise. 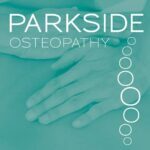 We do hope you’ll pop in and discover our unique collection of desirable, affordable brands in a friendly and welcoming atmosphere.